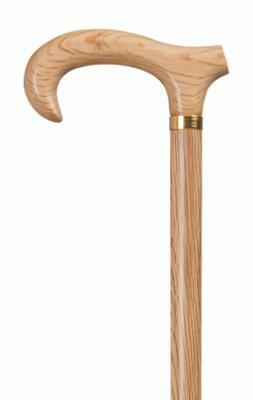 A very smart derby cane with a chic, modern appearance. Holm Oak is a European form of oak, with a pale colour and a very fine grain, which enables the craftsman to achieve a very smooth finish to the wood. The cane is fitted with a smart brass collar and a non-slip rubber ferrule. Ferrule diameter 16mm.